A man who graduated from Bowdoin College in Maine was among the four Americans killed in a suicide bombing in Syria. Jonathan R. Farmer, 37, was identified as one of the victims in the Wednesday attack. Rep. Chellie Pingree (D-Maine) said he had graduated from Bowdoin. ISIS has claimed responsibility for the bombing, but did not immediately provide evidence to support its claim. "Saddened to hear that Bowdoin College graduate and Army Chief Warrant Officer Jonathan Farmer was one of four Americans killed during an ISIS attack in Syria this week," Pingree wrote in a Facebook post. "Thinking of his family, friends & entire Bowdoin community today, and indebted to his service to our country." The attack happened just a month after President Donald Trump claimed that ISIS had been defeated and announced he was pulling out U.S. forces. Officials also identified Navy Chief Cryptologic Technician Shannon M. Kent, 35, and Department of Defense operations support specialist Scott A. Wirtz as victims from the U.S. The Department of Defense said the still-unidentified fourth person was a contractor. 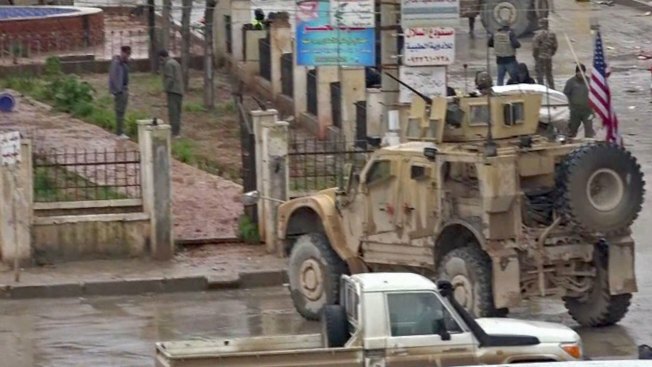 In total, at least 19 people were killed in the attack in the strategic northeastern town of Manbij, which highlighted the threat posed by ISIS despite Trump's claims. It could also complicate what had already become a messy withdrawal plan, with the president's senior advisers disagreeing with the decision and then offering an evolving timetable for the removal of the approximately 2,000 U.S. troops. The attack, which also wounded three U.S. troops, was the deadliest assault on U.S. troops in Syria since American forces went into the country in 2015. It has prompted new complaints about the withdrawal and underscored Pentagon assertions that ISIS is still a threat and capable of deadly attacks. The dead included a number of fighters with the Syrian Democratic Forces, who have fought alongside the Americans against ISIS, according to officials and the U.K.-based Syrian Observatory for Human Rights. Not long after the attack Wednesday, Vice President Mike Pence repeated claims of ISIS's defeat. Speaking at the State Department, Pence said the "caliphate has crumbled" and the militant network "has been defeated." Later in the day he released a statement condemning the attack but affirming the withdrawal plan.